I'm finally back from the crazed travel. Lots of stories to tell, which I hopefully get around to in the next few days. But for now, the saddest story ever, from CNN. I shed a tear at work - sniff! 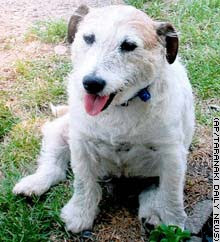 WELLINGTON, New Zealand (AP) -- A plucky Jack Russell terrier named George saved five children from two marauding pit bulls, but was so severely mauled in the fight that it had to be put down, its owner said Wednesday. George was playing with the group of children as they returned home from buying sweets at a neighborhood shop in the small North Island town of Manaia last Sunday when the two pit bulls appeared and lunged toward them, Allan Gay said. "George was brave -- he took them on and he's not even a foot high," Gay told The Associated Press. "He jumped in on them, he tried to keep them off. "If it wasn't for George, those kids would have copped it." One of the children, Richard Rosewarne, 11, was quoted in the Taranaki Daily News on Wednesday as saying George fought with the pit bulls to keep them off his 4-year-old brother, Darryl. "George tried to protect us by barking and rushing at them, but they started to bite him -- one on the head and the other on the back," Rosewarne said. "We ran off crying and some people saw what was happening and rescued George." But George was so badly mauled that a veterinarian had to put him down, Gay said. South Taranaki District Council official Graham Young said the two pit bulls had been impounded, and likely would be put down because of the attack. In New Zealand, owners of dogs judged to be too aggressive can be required to have them neutered and dogs involved in attacks are destroyed.